I hear the complaints all the time; I can’t sell on Etsy because there is too much competition. So many of my fellow Etsians are shutting down their Etsy shops because they claim Etsy is saturated with other shop owners selling the same products. I’ve actually heard of shop owners lowering their prices to be more competitive. Say what? Here are some tips on how to beat the competition on Etsy and WIN! Yes, there’s a lot of competition, but there is also a huge market. Think about it, if you sell where there are not many options for a buyer, the buyer won’t stay around very long will they? They will find a handful of items and then realize that this platform isn’t where they should be shopping because there isn’t a good selection. Ladies, we do the same thing when shopping for shoes, we gravitate towards those stores that have a larger selection, don’t we? Of course! Also keep in mind that if there is a saturated category on Etsy, then it’s because it’s a high selling category. All these shop owners wouldn’t be paying to list their items on Etsy if they weren’t actually making money! In order to be successful in a saturated Etsy market, you need to stand out from the rest of the crowd and be different! Many sellers start following trends, that’s where you get swept away in a tide of sameness. It’s okay to have a few trendy items but make sure to have a lot of different and unique items too. Make sure to develop your style and follow it. It can take a while to find your style (believe me I know) and then build a customer base who like what you make, but being different is the most important element of all. It will help you get found and give you a sense of pride when people gush over your work. Once you develop your style and determine how you are different from the other shop owners, you have to actually tell the shoppers! How can you tell shoppers why and how you are different when its an online shop? Easy, by using the Etsy About Page, Shop Announcement Section and Item Descriptions for this. What makes a shop owner different? How about how you got started, what inspires you, an unique place your find your materials, any special technique you use with your medium, etc. This list goes on and on. Dig deep to find your uniqueness and keep in mind as your business grows and evolves, your uniqueness can too. Another way to be successful on Etsy and stand out is to treat your shop as a business. Even though you may start out as a hobbyist to test the waters (like me), you really will not start making consistent money until you make this your business. Can this be a part time business? Absolutely. And I’m not saying you need a business license per say, you should check with your state on that, but I am saying you need to be consistent and take selling on Etsy seriously. Fine tune your Etsy SEO (Search Engine Optimization) which is slightly different than Google SEO. Research and determine what long tail keywords shoppers are using for your products (see video link below for one idea) and learn how to use them best. For example, use keywords in the title, tags, first paragraph of the description, shop sections, announcement, etc. Does it take time to learn? Yes, anything you want to be successful at takes time. Take advantage of the spaces Etsy gives you to tell your story. Use all the spaces in your titles, use all 5 picture slots, use all the shop Categories, complete your Policies in full (which should be updated at least once a year), populate your About page and keep it current, etc. I’ve seen many shop owners complain they have no sales but when I check their shop, they have no Shop Title, no Shop Announcement and no Policies defined. Why? Because they don’t realize how important these items are to being found in Etsy search results. Once you have your SEO on point and your shop is properly setup, you will need to have clear and beautiful pictures. We are in a visual world now with Instagram, Pinterest, etc. You have to have beautiful, bright pictures that are worth clicking on and that standout from a sea images. Load up your shop as much as financially possible! While you can start selling on Etsy with as few as one item, shops that have more items for sale are more successful. There is no magic number and the number of items listed is different for each shop. In a perfect world, for me, that would be 5 or more pages worth of listings. The reason I don’t have that many now is because, most of my items are originals and when they sell, they are gone and have a hard time keeping up with demand. If you can make multiples of one item, then even better, because when an item sells and is relisted, Etsy will move it up in the search rankings. Offer various price points to appeal to more buyers. For example, in my shop I have items ranging in price from $50-$200. 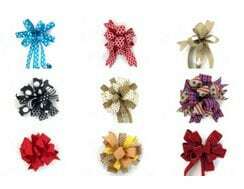 Find a price range that fits and works with your shop and niche. Just keep in mind your cost, labor, and expenses that are incurred for each of your items listed. You are in it to make money after all! What about all those sellers who sell for dirt cheap? Yea, those sellers won’t be in business long. They will either have to increase their prices or stop selling on Etsy because they will run out of steam. Plus most shoppers are not looking for garage sale prices on Etsy, they can get those in the Buy, Sell, Trade Facebook groups. Pick a social media platform that you like and then learn all that you can about it. Build up a following and promote your items to help drive traffic to your shop. Just keep in mind of the 80/20 rule; 80% content 20% self-promotion which is true for all the social medias. Social media is another great place to tell your story, show off your style and let potential buyers get to know you before buying from you. There are a lot of social media platforms but only one or two is really needed. Remember to go deep and not wide. Meaning learn all there is to know about one platform and not a little on all the platforms. Customer service starts as soon as a shopper lands on your shop. Make sure they know your Policies, know when they can expect an item, what to do if they don’t see what they want, etc. Make sure to answer any conversations as quick as possible to any questions or messages that are sent. Follow up a sale with a Thank You, tell them you look forward to hearing how they love your item and possibly send a reminder of any discount codes or promotions you may be running in the near future. You have to love what you do and do it often. I know some shop owners who have day jobs but have the passion and conviction to run a side hustle on Etsy in their off hours. Now that’s commitment. Most Etsy shops go through ebb and flows and if you don’t love it, you will not stick with it during the slow months which all successful shops do. There you have it, my 10 tips. Now, I know what your saying; Julie, this is a lot of work and takes time. And my reply is, of course it’s work, you can’t expect to get paid unless you work. For any new shop owners, keep in mind that it may take a new shop 2-3 months before making their first sale. But if this is something you love doing, I promise it doesn’t feel like work for long! Let me know what you think. Do you sell on Etsy? 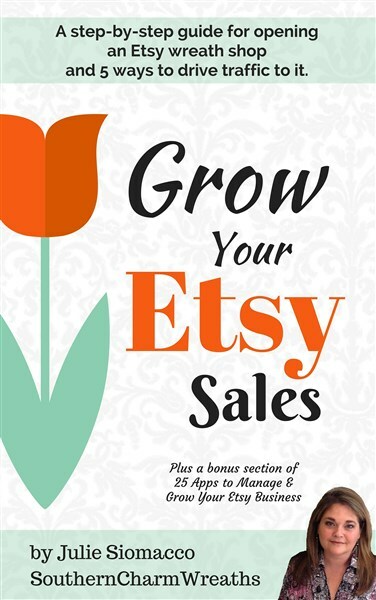 Do you want to sell on Etsy? 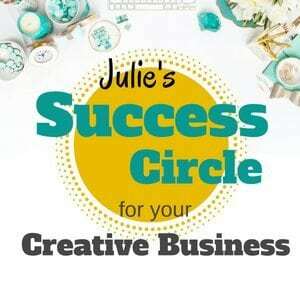 Are you like me and already making income selling on Etsy? If so, do you have any tips to on how to beat the Etsy competition for those naysayers? There is plenty of business in this niche for all of us to stay extremely busy on Etsy and networking/sticking together is what will keep some of us moving forward and persevering. So don’t hesitate to reach out to Etsy groups or Facebook groups for moral support. Love your blogs, ebook and tutorials. You were the first person I went to when I started making wreaths. 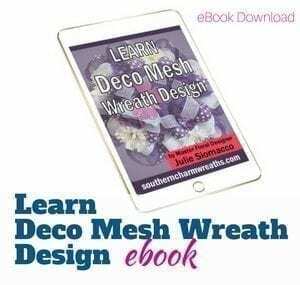 Do you have any tutorials or instructions on how to attach heavy items to a wreath so that they stay in place, don’t shift downward, and don’t flatten the mesh? That’s one problem I keep encountering. I know to empty out the “weight” in stuffed items, but what about heavy crosses, etc.? Well I don’t purchase it or consider it if it is too heavy due to shipping and slamming of the door. You need to wire the item to the frame and smashing of the mesh some is okay. Love your Blog ! How do you find and create a logo? I found someone on Etsy and had them create one for me. Love your video, and all that you bring to us in the “wreathing world”! Thank you for explaining Pic Monkey so well, hopefully I can figure it out now….have tried several times, but gave up. What app. 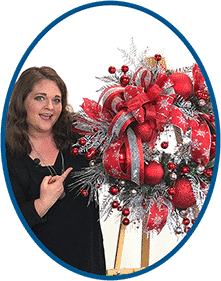 would you use if you are not able to photograph a wreath with a white background? Is there a way to do it in Pic Monkey that I have not figured out yet? Your background does not have to be white. You can use a fence outside, turn over a pic nic table & use outside, etc. Thanks for the help and encouragement! I’m really trying to get into this! …are there “rules” for doing this? If I see a picture on pinterest can I use it as my design? Are there copyright laws? Can someone sell on Etsy if they don’t have a PayPal account? Yes. You need a bank account.